Don't let the fact that LBJ has been kicking around the release schedule fool you, it is a fantastic spiritual bio of Lyndon Baines Johnson that may end up one of my favorite biopics ever. Focusing on Johnson from his running for President against John F Kennedy through his speech to Congress promising to pass JFK's Civil Rights act the film is less about the history (some details are left out or altered) then a spiritual man who is forced to change with the times. This is not about the details but how one man rose to put politics aside to change change a country and the world. There are two reasons to see the film. 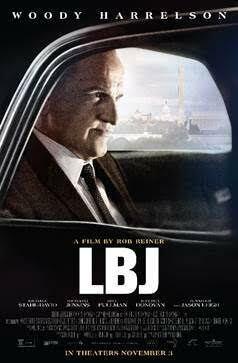 The first is that it is a timely and timeless portrait of a man who stepped up to the plate and did the right thing. While not as conservative as portrayed here, LBJ was a New Deal Democrat, he was from the South and was human enough to change his mind about civil rights as his world opened up by running for president. While the change in the film comes from other means, the realization of the problems faced by his cook, he finds a reason to fight for Kennedy's bill. (Often the biggest changes come from the most personal moments). The change as seen in the film is believable and moving and it helps to carry the film. The other reason to see the film is Woody Harrelson who gives a performance for the ages. He has never been this good and it should erase anyone who just thinks of him as a goofy guy. If you need a moment where he shows the scope of his talent watch the scenes after Kennedy is shot. Here is a man who has had his world turned four ways to Sunday. As the various events go on Harrelson doesn't act with his body but with his eyes and we can see everything he is thinking racing around in his head. All emotion is there and it's cutting. We feel his pain, and we marvel at his ability to pick himself up and move on. This is ultimately a film about the journey inside of an man ho changed the world and we see all of that journey thanks to Harrelson's performance. It moved me to tears. As good as the film is unto itself it isn't perfect. As I said it is fast and loose with some of the facts. Also the make up on Jennifer Jason Leigh is horrific and makes her look like Richard Nixon in a dress. On the other hand the film rises above all the flaws to be a wonderful portrait of a man in crisis. We come to understand what Johnson was going through and how he rose above. This is a super film and highly recommended.